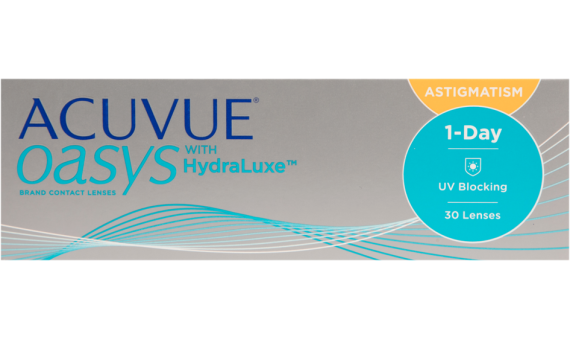 Experience excellent comfort all day performance with ACUVUE OASYS® for Astigmatism Contact Lenses 1-Day with HydraLuxe™ Technology. These lenses are made for the demanding days that can leave your eyes feeling tired, heavy and dry. 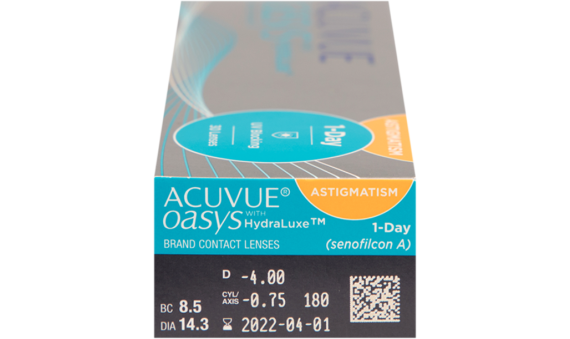 The irregular curvature of the eye that characterizes astigmatism might have historically made finding contact lenses difficult, but Acuvue's Accelerated Stabilization Design technology solves that problem. These lenses won't rotate when you blink or move your eyes around quickly. Plus they offer the highest level of UV blocking available in a daily disposable.Whether your eyes get fatigued from a long day of staring at digital devices or dry from spending time in challenging environments, these daily contacts help keep your eyes feeling fresh and comfortable.